The Eagles' playoff game at the New Orleans Saints will be the fifth consecutive playoff game in which Philadelphia is a betting underdog. They have won the previous four outright. The Eagles have opened up as 8.5-point underdogs for Sunday’s NFC divisional playoff game at New Orleans, site of their most lopsided loss of the season. It’s one thing to get past Mitchell Trubisky in Chicago, no matter how heart-stopping. It’s another story entirely to beat Drew Brees in the Superdome. This will be the fifth consecutive playoff game in which the Eagles are underdogs. They won the previous four outright, including Sunday’s victory in Chicago, where they were 6.5-point underdogs. The only other defending champ in the last 25 years to be underdogs in the first two rounds of the following postseason was the 2001 Ravens, according to research done using Goldsheet.com. The Saints (13-3) are the conference’s No. 1 seed and were 6-1 at home this season before a Week 17 loss to Carolina in which Brees and many of the other regulars didn’t play. New Orleans also lost at home to the Buccaneers in Week 1 when the defense allowed Ryan Fitzpatrick to throw four touchdown passes. The Eagles were hammered by the Saints in New Orleans, 48-7, in Week 11. New Orleans was a seven-point favorite, and the loss dropped the Eagles to 4-6. Afterward, Eagles safety Malcolm Jenkins called out his teammates' efforts. It also inspired the Saints to continue their trash talking. » READ MORE: Who was Malcolm Jenkins talking about in Eagles' ugly midseason loss? 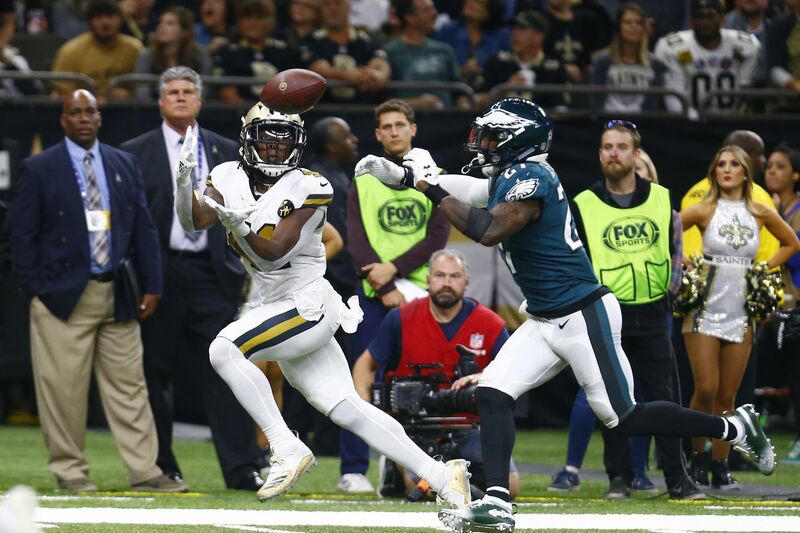 Over the summer, New Orleans running back Alvin Kamara said the Saints would have beat “s***” out of the Eagles, had they met in last year’s NFC championship game. New Orleans lost the previous week on the Minneapolis Miracle. He doubled down on Twitter following the 48-7 win. The Eagles have covered their last three on the road -- all with Nick Foles under center. New Orleans covered just four of seven at home, not counting Week 17′s meaningless loss to Carolina.